Last year when we went to my grandma’s house for Thanksgiving, I made Grandma Ople’s famous apple pie and it was a huge hit. But I have never believed the saying “if it ain’t broke, don’t fix it” So I invented my own saying. Pretty profound right? That’s basically the philosophy of Recipe Showdown, and why I encourage you guys to challenge me to try your recipes. The quixotic task of finding the perfect recipe is never-ending, but the process is delicious. As soon as the leaves begin turn orange, I start thinking about Thanksgiving. Stuffing, cranberry sauce, green beans, mashed potatoes, and the essential assortment of pies. Chocolate pie, pumpkin pie, pecan pie, boysenberry pie, and my personal favorite, apple pie. This year, I want to make sure that I make the best apple pie yet. I saw a very enticing recipe on one of my favorite blogs, A Cup of Jo, and decided to put it against the reigning champion (Grandma Ople’s Apple Pie). For both pies, I used Smitten Kitchen’s All Butter, Really Flaky Pie Dough. I believe that pie crust should always be all butter, and always be very flaky; hence, this is the perfect recipe. 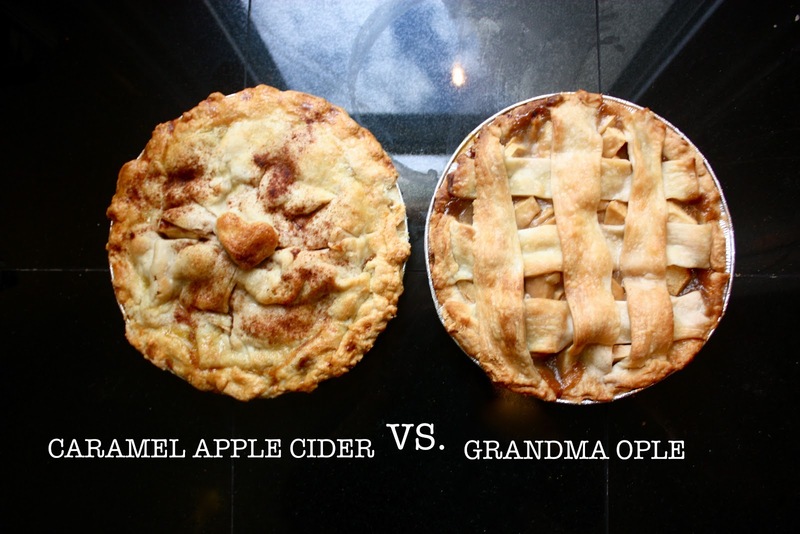 Both of these pies are absolutely delicious; however, good ol’ Grandma Ople did better in the taste tests. I made two, small changes to the recipe. Pour the sweet, syrup mixture onto the apples before adding the lattice crust. Last year, I did it afterwards (as the recipe suggests) and I ended up with burnt, sugar pieces on the top. The tasters suggested adding cinnamon to the recipe, so I added two teaspoons of cinnamon to the syrup. and water; bring to a boil. Reduce temperature, and simmer 5 minutes. Stir in the cinnamon. with a lattice work crust. (175 degrees C), and continue baking for 35 to 45 minutes.